1. The Grand Palace and the Emerald Buddha Temple. 3. The Temple of Dawn, across the river. 4. The Bangkok City Shrine and the adjacent majestic building of the Ministry of Defense. 5. Flower Market at Pak Klong Talad – the biggest and busiest 24 hour flower market, especially in the evening. 7. The Royal Pramaine Ground in front of the Grand Palace and the National Museum. 8. Boat trip into " Bang Luang " Canal or "Bangkok Noi" Canal opposite the hotel. Wat Phrasrirattana Sasadaram (Wat Phra Kaeo), or the Temple of the Emerald Buddha, situated within the Grand Palace, near Sanam Luang, is a sacred symbol of the Rattanakosin, or Bangkok, Dyansty and the most important temple in realm. It was built by King Rama I, the founder of the Chakri Dynasty, at the same time as the Grand Palace in 1782, when he established Bangkok as his capital, in order to serve as the palace chapel, in which traditional royal ceremonies would be conducted. It thus has a sanctuary for the performance of Buddhist rites, but no residences for monks. The temple is richly endowed with fine art and architecture. The Emerald Buddha image is enshrined in the phra ubosot, the exterior walls of which are covered with beautiful designs in gold leaf and glass, while the interior walls bear murals depicting the life of Buddha and other subjects. The phra mondop, or library, is set on a high base surmounted by a stepped pyramid. Inside is reserved a chest containing the Tripitaka, the Buddhist sacred scripture. The Royal Pantheon, or Prasat Thepbidon, has a high spire. 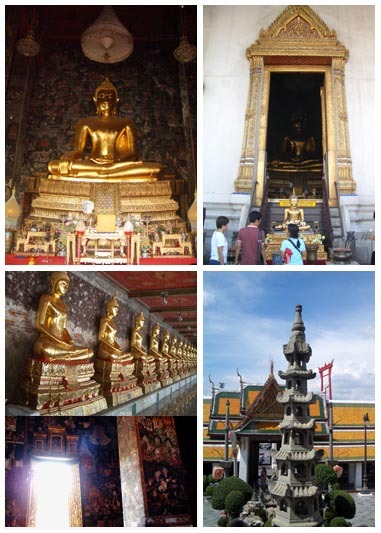 Inside are enshrined statures of the eight previous kings of the Chakri Dynasty. Next to phra mondop is a miniature replica of Angor Wat, which King Rama IV had constructed. The walls of the cloister are decorated with murals showing scenes from the Ramakian, the Thai version of the Ramayana. 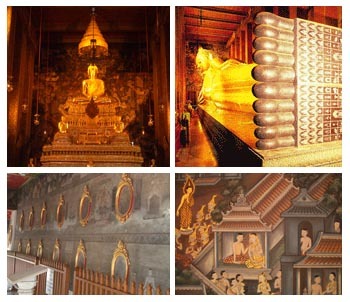 These were originally painted during the reign of King Rama I and have been restored several times. Wat Arun, the Temple of Dawn, is one of Bangkok's best know landmark. 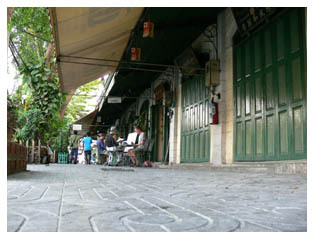 It stands on the west bank of the Chao Phraya River in Thon Buri. Wat Arun is best seen from the opposite bank of the river; it glistens in the sunlight during the day and stands dark and noble at dawn or dusk. A visit to the beautiful, peaceful monastery complex surrounding the familiar towers is very worth-while. These towers, the "Phra Prang," although best known, the only part of Wat Arun. 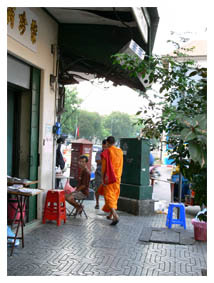 It also contains narrow lanes; elegant, old white buildings; shrines, pools of turtles and two fine giants, " Yuk Wat Jaeng," mortal enemies of the " Yuk Wat Po" across the river. The monastery has existed for many years since the days when Ayutthaya was capital of Thailand. 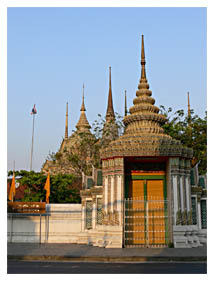 It was then named Wat Mokok, situated in a place called Tumbol Bangmakok. The word Bangmakok, meaning " Village of Olive", has since been shortened to " Makok".When King Taksin and his army reached this place to build his new capital Thonburi, after defeating the Burmese who had sacked Ayutthaya, he arrived at dawn. He renamed the monastery he found there Wat Jaeng- Jaeng meaning "clear", "bright" and Construction of the tall prang and four smaller ones was started by King Rama II 1809-1824 and completed by King Rama III (1824-1851). The towers are supported by rows of demos and monkeys. Very steep and narrow steps lead to a balcony high on the central tower. The circumference of the base of the structure is 234 meters, and the central prang is 250 foot high. The central balcony commands an impressive view of Bangkok across the river. From here one can see the Grand palace, the Temple of the Emerald Buddha and the spacious Wat Po. The towers of Wat Arun are built of brick covered with stucco. The decorations are unique; thousands of pieces of multicolored Chinese porcelain. In niches in the central tower are green figures of the God Indra seated on Erawan, the traditional Thai three-headed elephant. Niches in the smaller towers contain figures of the Moon God, on a white horse. The trident of Shiva extends from the top of each tower. Wat Arun figures in one of Thailand's most colorful festival, the Royal Tod Kathin. Then His Majesty the King travels down the river in a procession of Royal barges to present new robes to the monks after their three-month lent period. Wat Suthat Thepwararam is a royal temple of the first grade. It was King Rama I's intention to make Bangkok as glorious as Ayutthaya had been, so built a temple as large as Wat Phanan Choeng in the Old Capital to install a large image of the Buddha named Phra Sri Sakyamuni which had been brought down from the grand Wihan of Wat Mahathat in Sukhothai. When he had finished the foundation of the grand Wihan and placed the Buddha image in its proper place, he passed away. King Rama II went on with the building by continuing with the Wihan. He himself worked on the carving of the central door panels but he passed away before the temple was completed. During the reign of King Rama III the Wihan was finished and he added many more buildings all over the temple compound. He gave the name to the Buddha image in the grand Wihan, of Phra Sri Sakyamuni and the one in the Ordination Hall, of Phra Trilokachet and the name of the temple as Wat Suthat Thepwararam. Renovation took place in the reign of King Rama V. This temple is highly admired for its entire plan. 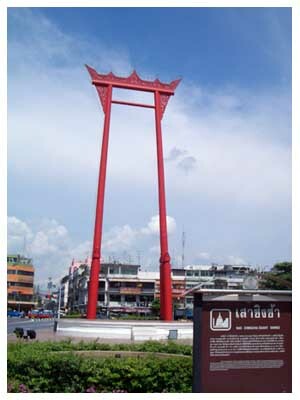 Sao Ching Cha sometimes known as the "Giant Swing", stands directly in front of the Wihan of Wat Suthat. It was the sight of the ancient Brahmin rite known as 'Tri-yampawai' which had been passed on since time of Sukhothai and enacted in the succeeding capitals of Ayutthaya and Thonburi. The monument was erected in 1784 by order of King Rama I shortly after founding the city in 1782. (B.E 2325) Triyampawai was the enactment of an ancient Hindu epic depicting the creation of a new world by the god Brahma who sent the god Siva down to look after the new world. With the decent of Siva, the Nagas (celestial serpents) wrapped themselves around mountains on both sides of the sea in order to hold the earth in place while the god stepped down with only one foot, fearing the infant earth was too soft to receive him. Yet the earth stood fast. The nagas rejoiced at the strength of the new world and plunged into the seas in celebration. The two pillars of the swing represent the mountains on either side of the sea, while the circular base represent the earth and the seas. The ritual calls for the participants (naliwan who represent the nagas, to swing back and forth on a specially constructed board calling the gods to witness the event. The ritual was intended to instill a sense of security and confidence in the minds of the people that the new capitl city would be strong. The sponsors of the event spent vast sums of money on it and the accompanying festivities, thus illustrating that the economy was stable. The celebration was held for ten days at the end of December or early January. When the country changed from an absolute monarchy to a constitutional monarchy in 1932, the event was discontinued. Still today, the swing remains on Bumrungmueng Road, a sign of the enduring strength of Bangkok as the capital of Thailand. This temple is an old monastery which was first built before the rise of Rattanakosin. 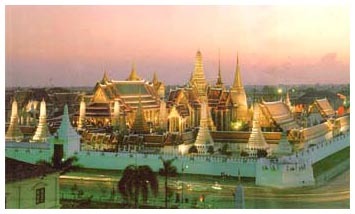 King Rama I redeveloped and improved the condition of the temple. The Golden Mount, one of the unique landmarks of Bangkok, is located within the area of this temple. The construction of the Golden Mount started in the Third reign (1826-1851( and completed in the Fourth reign (1851-1868) and the Fifth reign (1868-1910). With little effort, the Golden Mount can be walked up to the top. From the top of the mount, a golden pagoda is situated and this area is one of the best points to observe the panoramic view of the entire Rattanakosin area.